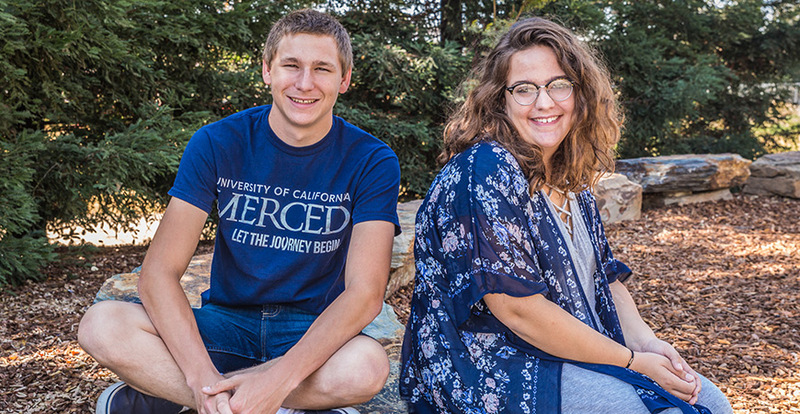 Michael Grey and Elspeth Beardsley are two of the more than 200 Regents Scholars who have attended UC Merced. More than 22,000 students applied to UC Merced for the Fall 2017 semester, and about 2,300 are now beginning their educational journeys on campus. Among those, 24 rose to the top of the class to be named Regents Scholars, recipients of the University of California’s most prestigious scholarship award. First-year student Michael Grey is one of those select 24, having proven himself through determination and diligence. He said taking advanced placement and honors courses in high school in Antelope, just north of Sacramento, motivated him to succeed academically. “The classes challenged me to think differently and use various perspectives and techniques when analyzing,” Grey said. Being named a Regents Scholar was a relief for Grey. He and his older sister were raised by their grandparents, who aren’t able to help to pay for college tuition and expenses. Since its first academic year in 2005-06, UC Merced has awarded 203 Regents Scholarships to incoming students selected based primarily on their academic achievements. “In order to build a community of high achievers, we must recognize those who have already demonstrated academic distinction within their schools and communities,” Director of Financial Aid and Scholarships Ron Radney said. This scholarship lifts the burden and provides me comfort in knowing that I can focus on my future career and education and not have to worry about how I am going to be able to afford college. Elspeth Beardsley was homeschooled during high school and completed several Merced College courses simultaneously, allowing her to graduate with an Associate of Arts degree only a year after graduating high school. She received Superintendent's Honors for completing more than 36 units of coursework with a 4.0 GPA. The Spanish major chose UC Merced because of the smaller class sizes, greater access to research opportunities and ability to study abroad. Attending a UC in her hometown also allows her to eliminate housing costs by living at home. All students who apply to UC Merced are considered for the scholarship, which averages about $10,000 per year. Regents Scholarships are awarded to incoming first-year students for up to four years and transfer students for up to two years. The average high-school GPA for the newest class of Regents Scholars is 4.18. First-year students who were awarded the Regents Scholarship scored an average 1190 combined on the SAT. For many, the scholarship provides the boost they need to make their dreams a reality. “Without the help of this scholarship, I am not sure I would have been able to get a UC education,” Beardsley said.